Crocodile Dundee. Paramount Pictures 1986. Culture clash and Australian stereotypes. An icon in American perception of Australia. I’ve been waiting a long time to get access to this one. For all the fame of this movie, the only thing I’ve seen that comes directly from it is the memetic “that’s not a knife”. The rest is a complete blank. Just a cartoonish expert of the Outback in somebody else’s world. New York reporter Sue Charlton hears a remarkable story about a bushman in the Northern Territory who had his leg torn off by a crocodile and crawled his way back to civilization a week later, and arranges an interview with him. While the story’s been a bit exaggerated, as Mick Dundee (the “Crocodile” nickname was his safari business partner’s idea to dramatize him) still has both legs, he still turns out to be a remarkable man. Over the several days he guides her through the path of his adventure, he shows himself to be uncannily savvy about the wilderness, reveals a sensitivity to his simple philosophy, and saves her from a crocodile, so of course they develop an attraction. But then he returns with her to New York so she can write about his perspective of the city, and while he befriends the strange locals, her boyfriend isn’t so gracious with him. Mick is surprisingly subdued and complicated. 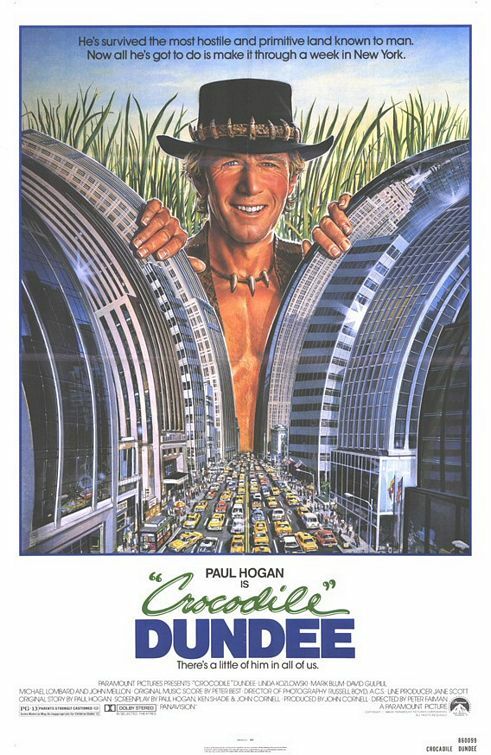 Maybe that changed in the sequels, but it’s clear that as the main writer, Paul Hogan really wanted to play to all of his own strengths, especially the ones that aren’t well shown working as a comic. Mick may be hypercompetent in the bush, but it always feels grounded in reality, that maybe he could just be the best tracker in the world. And then in New York, he may not always understand the conventions, but he often understands the people better than they understand themselves. He assumes that all these people must be living so close to each other because they’re exceptionally friendly, so he makes a point to be outgoing with everyone, and his Aussie charm infectious. The first half, set in Australia, is almost Romancing the Stone light. The civilized female writer is stuck alone with the savvy wilderness guide and prickliness gives way to romance. The humor is very subdued next to the second half, which mainly concerns itself with highlighting the much more numerous absurdities of New York, rather like Coming to America but with much less exploration of class and race, favoring instead to continue to build up Mick. Which is not to say I didn’t enjoy how good he was at just about everything. For its reputation, this movie is surprisingly light on stereotypes and rather feels more like an honestly researched exploration of culture differences. The tone isn’t as slapstick as I got the impression, but that only makes it more enjoyable.